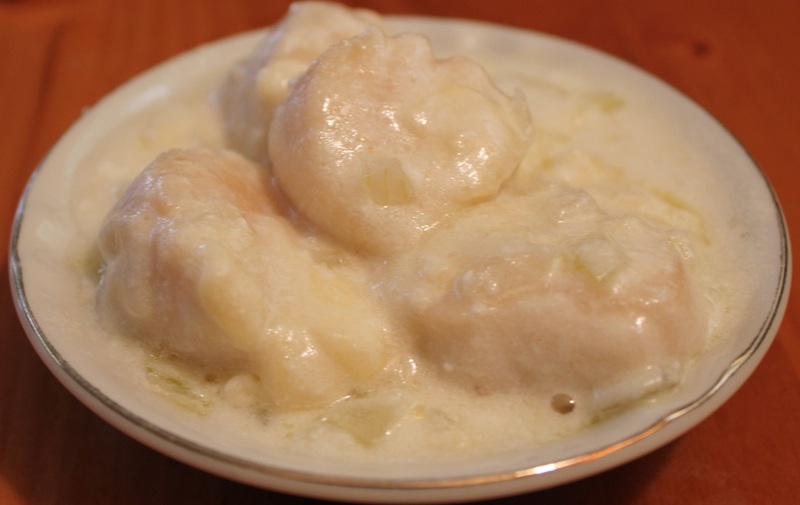 Scallops in a heavenly cheesy cream sauce cooked until tender. Heat skillet over medium high heat. Add 1 teaspoon olive oil, saute scallops for 3 minutes. Remove scallops and set aside. Heat 1 tablespoon butter in saucepan. Saute onion and garlic until tender. Remove pan from heat, stir in 1 tablespoon four until well mixed. Replace pan on the heat, stir while slowly pouring wine and chicken broth into flour mixture. When sauce becomes thick add lemon juice and yogurt. Pre-heat oven to 400 degrees. Coat 4 gratin or ramekin dishes with cooking spray. Place 1/4 of scallops in bottom of each dish. Pour 1/4 sauce over scallops and top with 1/4 Swiss cheese. Bake uncovered for 12-15 minutes.